The Cost to Build a House - Armchair Builder :: Blog :: Build, renovate, & repair your own home. Save money as an owner builder.- Armchair Builder :: Blog :: Build, renovate, & repair your own home. Save money as an owner builder. Would you like to know the best way to determine the cost to build a house? Armchair Builder has just completed a detailed review of the top cost estimating resources on the market available to owner-builders. We realize that cost plays a huge role in your decision to take on a new home building project so you need to know which cost resources you can trust. The biggest surprise to us was the number of resources available. There are literally hundreds of options out there. So we hope our analysis will help you cut through the clutter and get to the numbers you need. One other note…we don’t own, operate, or get paid by any of the resources we recommend here so we are able to provide an unbiased review. So let’s dig deeper into how to determine the cost to build a house. Role of Cost Estimating: Before we take a look at the results of the review, we need to discuss the role of cost estimating for your new home project. When we talk about cost estimating, we really mean rough cost estimating. In the early stages of your project, you are trying to determine if a particular lot and house plan combination will fit your budget. You don’t want to go through the hassle and time consuming exercise of bidding out the work, only to find the costs to be too high for your budget. This will only aggravate your subs and suppliers and waste your precious time. You also don’t want to spend money on house plans prior to determining the rough cost to build a house. You first want to see if the cost to build a particular plan comes close to matching your budget. You want an estimating resource that can get you close to the cost to build so you can evaluate possible land and house plan combinations. Another possible reason for determining an initial estimated cost to build a house would be for bank loan discussions. In order for your cost estimate to be used with your bank, you will need a detailed cost estimate showing each cost item involved in the project. One last possible use for your rough cost estimate to build a house …if you decide to hire a general contractor to build your home (instead of acting as the general contractor yourself) you can use your estimate to review bids from general contractors. Limitations: Don’t expect your rough cost estimates to be perfectly accurate. After all, you may not know what flooring, appliances, exterior siding, or roof type you want…so how could the estimate be 100% accurate? The key to a solid rough estimate at this stage is to make close assumptions for the types of materials and plan details that you have in mind. If your rough cost to build a house is within 10-20% of the actual cost to build, you have done a great job. This is why I tell people considering a new project to figure on spending no more than 80% of their budget just in case things go over. You can always find ways to spend the additional money after closing if your project comes in under budget. Factors Considered in Our Review: Our review of the resources for estimating the cost to build a house took into consideration the cost of the resource, ease of use, flexibility, and accuracy of the estimate. Since cost is always a consideration, we limited our reviews to resources that cost $100 or less. Anything more than a hundred bucks for a rough estimate is too costly for us to recommend. We considered ease of use from the standpoint of being user friendly. Meaning, how easy is the resource to figure out. Some of the computer based estimating programs we looked at were difficult to set up or navigate. One other note about ease of use…we aren’t saying they are quick. The best estimating programs require you to spend time reviewing the assumptions to make sure they match your particular project. Based on our review, the resources that produced a quick result were highly inaccurate (up to 65% off of the actual cost to build a house). Maybe you are familiar with the old cliche…junk in, junk out. Any cost estimating resource you ultimately decide to use will be only as good as the information you put into it. The same goes for free programs. The free programs we reviewed were so basic and inflexible, we were unable to tailor the costs to our particular project. We love a deal at Armchair Builder…but unfortunately, none of the free programs we found were worth using. We also looked at flexibility in our review of cost estimating resources to see whether they could be tailored to fit your new home project details. For example, if you wanted a special type of wall like a SIP (structural insulated panel), would the resource allow you to make that adjustment? Your wall choice, like many other components in a new home, can vary greatly in price from one type to another. If you can’t factor these into the estimate, your estimate of the cost to build a house will be worthless. The last item in our review was the accuracy of the final cost estimate. We compared the actual costs we have from building new homes to the results of the estimating resources. We realize that you, as an owner-builder, don’t have access to these numbers. So, how do you compare estimating resources? That’s where Armchair Builder comes in. We want to be your trusted resource to help guide you through the maze of options available to you. Results: Because some people live life on the computer and a few others can’t stand them, we’ve decided to recommend both a computer based estimating resource and a written resource in book form to determine the cost to build a house. For the computer based resource, the best option from our review is online at Home-Cost.com. All of the Home-cost.com estimating options are easy to use as the programs ask questions to guide you through the creation of your cost estimate. The level of detail is there for you to see. 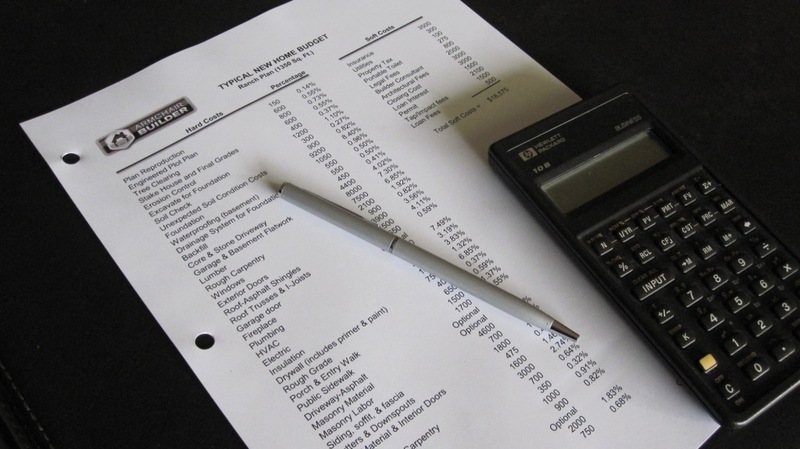 Unlike many other programs, home-cost.com gives you the assumptions made behind the costs. This allows you to adjust the costs for your particular project. With several thousand design options, you can tailor your estimate for the cost to build a house to your particular project. You can also change an option you aren’t sure about in order to see how it affects the overall cost of your project. The accuracy of the cost estimate we performed was within the acceptable range (after making adjustments for the differences in our particular home). Home-cost.com offers several different levels of online estimating resources to determine the cost to build a house. If you are only looking to see if a possible lot/plan will fit your budget, Resi-Cost Lite will be your choice ($49 for two months of use). If you plan on using your estimate for initial bank submission and as an initial budget prior to bidding out, you will want the Resi-Cost Full Function which will cost you $99 for two months of use. The Full Function gives you more design options to choose from (4000 vs. 2900 for Resi-Cost Lite) and provides you with much more cost detail (350 lines vs. 70 with the Lite version). Home-cost.com also offers an Instant version for $9.99 a month but we feel the best value is in the Full Function or Lite version. We are told that all of these options use the same proprietary method for obtaining the estimated cost to build a house. So, the biggest differences between the program options are the flexibility to tailor to your particular project and the cost line item detail…as the price goes up, so does the flexibility and cost line item detail. Cons: None that we could find in our test. 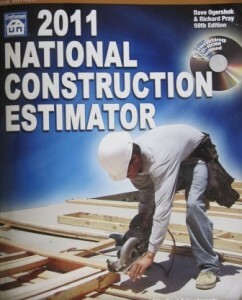 For our cost estimating book recommendation we chose the 2011 National Construction Cost Estimator by the Craftsman Book Company. The cost is $62.50 for the 2011 version ($72.50 for 2012). Don’t be intimidated by the size of the book. The main focus for the owner-builder would be mostly on just a few pages for creating a rough estimate for the cost to build a house. For our rough estimate, we used page 305/306 which includes the Construction Economics Division, Construction Cost Index for New Single Family Homes. Although not as flexible as some other cost estimating resources out there, the Residential Rule of Thumb home cost estimating resource was very accurate in our tests. Although we didn’t review it here, one other estimating book that we have had good luck with in the past is Means Contractor Pricing Guide Residential Square Foot Costs. We chose not to include this guide in our review because of the cost (over $100). If you can grab a recent version from your local library, it would be a good tool for your new home building project. One of these cost estimating resources should get you started to determine a rough cost to build a house. Keep in mind, you will still want to do a thorough job bidding out the project once you have your plan finalized and your specifications set. Your final budget to build will be created from the actual bids you get back from trades and suppliers. Don’t forget to check out the Armchair Builder Estore for some great resources to help you build a quality project and save money as an owner-builder.